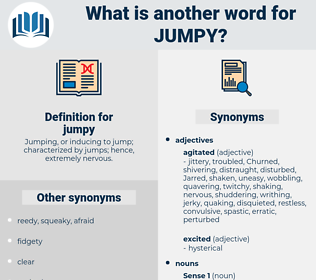 What is another word for jumpy? 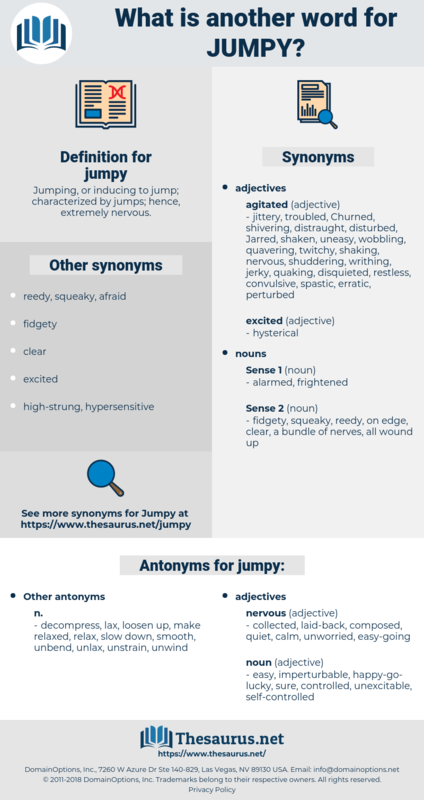 Jumping, or inducing to jump; characterized by jumps; hence, extremely nervous. nervous, jittery, high-strung, flustered, restless, edgy, twitchy, cranky, excited, upset, uptight, excitable, neural, pissed, tense. collected, laid-back, composed, quiet, calm, unworried, easy-going. easy, imperturbable, happy-go-lucky, sure, controlled, unexcitable, self-controlled. decompress, lax, loosen up, make relaxed, relax, slow down, smooth, unbend, unlax, unstrain, unwind. I made the poor thing jumpy. The echoes amongst the rocks, and the rather gloomy gorges, seemed to make them " jumpy"; a stone rattling down behind them would be sufficient to cause a panic.